If ever a race summed up a season it was today's Indian Grand Prix. 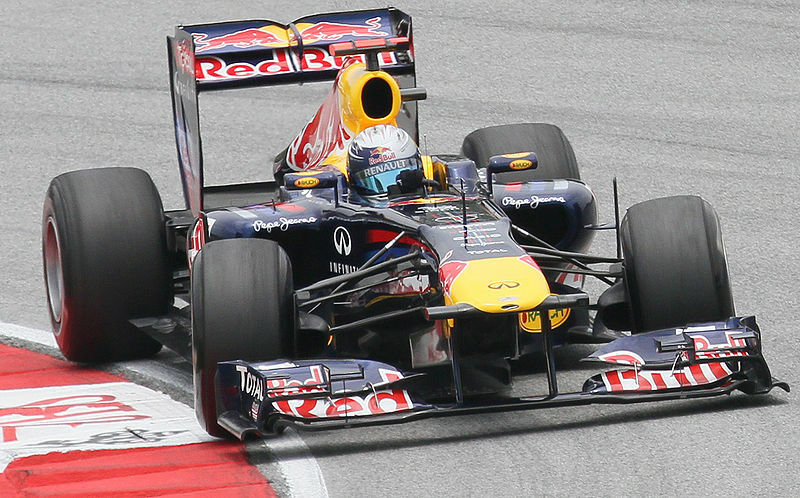 Sebastian Vettel won with a controlled, precise and dominant performance at the front. Jenson Button, after struggling in qualifying, ghosted forward to second and performed formidably to keep Vettel honest. And Fernando Alonso completed the podium with a tenacious run, probably a place that his car didn't deserve. Oh, and Felipe Massa and Lewis Hamilton collided with each other. It was a pity that India didn't witness a more enthralling race at the front for its inaugural Grand Prix, but once again there was so much to admire about how Sebastian went about his business. It was copybook Vettel, the sort of win from the front display that we've seen repeatedly this year: get out of sight quickly and then pace yourself, and react to whatever those behind decide to do. That he pulls off the trick repeatedly doesn't make it any less impressive. He led every lap and once again claimed fastest lap on the last time around, as if to underline his preponderance. And yet another record tumbled: most laps led in a season, held by Nigel Mansell since 1992, fell to Seb today. Again, not for the first time this year, Jenson Button came alive on a Sunday and was by a long way Vettel's nearest challenger. It seemed a million miles from yesterday's qualifying wherein Jenson cut a dejected figure, bemoaning a lack of grip. He moved up to second place within four corners, taking advantage of Alonso running wide at the first corner and then smartly outdragging Webber down the long straight. He had to repel a racy Webber in the early laps, but then settled down to do what he could to cling to Vettel's coattails. Seb had the whole thing under control, but Jenson still didn't leave anything out on the track. Then there's Fernando Alonso, who refused to give in and maxed out his car to take the final podium slot. He clung to Webber in a similar way that Button did to Vettel, and managed to leapfrog the Australian by staying out longer on the soft tyres at the final stop. Webber's run to fourth was decent enough, but once again there's a nagging question as why he's not running a bit closer to his team mate more often this year. So, to the nth case of Felipe Massa and Lewis Hamilton making contact with each other. Lewis was curiously off the pace today, in a race where he was fully expected to make forward progress after his strong qualifying pace and grid penalty. He didn't however, and Massa had in fact passed him off the line. Lewis looked a bit more active after his first stop, and after a brief dice with Massa he moved down the inside of him at turn 5. He was half alongside when Massa turned in, the two collided, which compromised them both and Lewis had to change a damaged front wing (as did Massa, some time later). It struck me as a clash that had culpability on both sides, indeed it was remarkably similar to the two men's contact in Monaco this year. On one hand Lewis was not fully alongside Massa, but on the other Massa by turning into the corner was guaranteeing an accident, and appeared to be looking in his mirrors repeatedly so certainly was aware of Lewis's presence. You also wonder if Massa would have been as inclined to turn in if it wasn't an opponent he had such as previous with. Nevertheless, I feel if Massa had been smarter he would have given racing room, much as Alonso did at Spa this year when Webber came alongside into Eau Rouge. Still, it was surprising that the stewards entirely apportioned blame to Massa, giving him a penalty and not Lewis (a penalty for neither would have been more appropriate). I hope it doesn't represent what seems to be a recent desire by the stewards to 'equalise' the outcome of a clash in some way, rather than punish bad driving. In the end, Massa left the race early, not covering himself in glory by breaking his suspension on a high kerb for the second time in two days. As they say: you fool me once, shame on you; you fool me twice, shame on me. Michael Schumcher came home fifth, ahead of his team mate. Once again, Schumi was outpaced in qualifying by team mate Nico Rosberg but looked the more convincing of the two Mercs on race day. He's now only five points shy of Rosberg in the drivers' standings (and I don't believe for a second his claim that he's not concerned which Mercedes pilot is ahead in the table at the season's end), and while he may not have the raw one lap speed he once did, the behaviour of the Pirellis on race day allows him to put him his brain power, ability to strategise and to adapt to good use. These are skills still sharp it seems. Toro Rosso continued their good form, witnessed in Korea last time out. 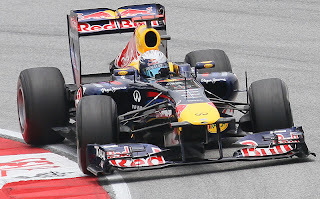 Jaime Alguersuari was again impressive in coming home eighth, and Sebastien Buemi also would also have likely taken points as well had he not retired before half distance with what looked like an engine failure. Adrian Sutil took a timely P9, on a weekend where his chances of a race seat for 2012 appeared to diminish rapidly. And Sergio Perez completed the scorers, having started on the hard tyres and pitted early to get them out of the way, and from then on employing what was effectively a one stop strategy. He beat Vitaly Petrov narrowly, who was on the same strategy. And despite the relative lack of on-track frolics, this weekend was an encouraging debut for the Indian Grand Prix. The new facility was certainly well-received, and there was large and enthusiastic crowd in attendance today (though it wasn't a sell-out). Of course, as with other new F1 countries, what happens now is vital, and let's hope this is the start of the building of an motor sports infrastructure in India, as well as that the crowds are maintained and built upon in future years. Today instead was all about 2011 - which is all about Sebastian Vettel and Red Bull.